Can you believe its the end of the month again already?! This year is seriously flying by! Even though I've had a relatively quiet month it has been fun, and there are some products that I've been really enjoying too! I got this as part of a secret Santa gift at Christmas and I finally got round to using it. I don't use body scrubs or polishes as often as I should but I really enjoyed this one! There are small coarse scrub pieces and also large 'strawberry seed' scrub pieces which are a very sweet touch. As with all BodyShop products, the smell is amazing and long-lasting and it is made with natural ingredients. I did find that this bottle didn't last all that long but it is only £5.00 a bottle so it is something I could repurchase for myself. I used this a while ago and really enjoyed it and I finally got round to buying another bottle this month. I find this much more refreshing and powerful than the Garnier alternative and I think the packaging is nicer too. A little of this goes a long, long way and although its not the cheapest on the market I think it is well worth the money as it really gets deep into your skin to remove dirt and excess makeup. I picked this up on a whim when my Bourjois Healthy Mix Foundation ran out earlier this month. I saw that it was a new release to the MUA line and it was only £3 on offer! I didn't expect it to be excellent, I just wanted something as a stop gap until I got paid, but it has pleasantly surprised me. It gives my skin a gorgeous, flawless glow and it lasts ages on the skin (even more so when used with a primer). I do find it takes a fair bit of blending to get it looking even but that's no bother. MUA really know how to offer a great product at a bargain price! Another product I am re-discovering! I came across my old half-empty bottle of this when I was having a sort out of my makeup stash earlier this month. I remembered how much I loved it and decided to try it again. I still loved it and have been using it since! I did have to buy a new bottle though as, understandably, my old one was past its best and went a little crumbly once applied on the skin - not a good look! This is just the ultimate primer for me, it effectively evens out the skin, blurs any lines or imperfections and I even feel confident enough to go out wearing just this without foundation! I bought this to prep my lips when using my Gerard Cosmetics Underground lipstick, but I actually prefer just wearing it on its own! I'd say the shade is more 'griege' than light brown, but either way it applies smoothly with a non-drying, matte finish and lasts for an impressive amount of time (try 3-4 hours) for the price. The pencil is chunky so you will need a special sharpener for it but it means easier application and better results. I am so pleased I gave this a try and I am looking forward to picking up some other pieces from the range. Dan bought this for me as my skin on my hands and wrists is just getting awful. I'm not sure if its eczema but I seem to get flare ups where it is insanely itchy and it ends up scabbing and bleeding (nice :/). Anyway, he bought this for me and the smell is just beautiful! It is so warming and relaxing, it makes me feel tranquil and I could just sit here all day smelling it! The formula is super rich and doesn't leave my hands feeling all greasy, so it is an all round winner for me! Plus, the size is perfect for keeping in my handbag for top-ups throughout the day. If there was an award for binge watching a TV show as quickly as possible, I'm pretty sure Dan and I would win it for how fast we've watched this. We literally started watching it about 3 weeks ago and we've already come to the end of the current season! This is the strangest, scariest, most interesting, haunting, exciting, suspense filled, twisted show I have ever had the pleasure to watch and I am literally going to sit here gathering dust waiting for season 6 to come out. The same cast of actors play different characters in a different storyline each season (which is great because if you don't like one season you can skip it and still be in the loop) and it is just incredible! I didn't realise how fast you could get attached to a character and develop an understanding for them and get deeply involved with a story line but AHS seem to achieve it over and over again. What were you loving this February? I was recently taking some time out and reading through some of my favourite blogs when I came across Paula's - of Blossomikebana - valentines day post. 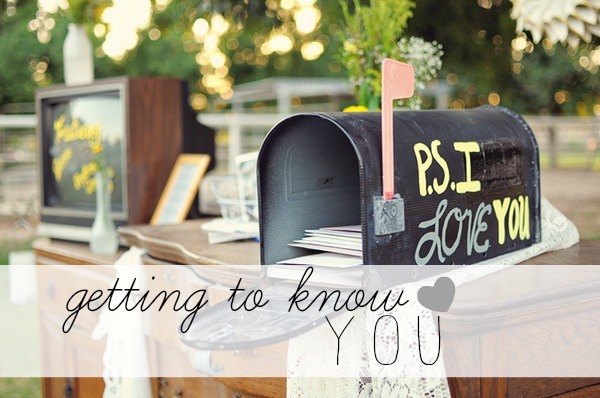 Instead of the usual, run-of-the-mill valentines post, Paula had made her readers feel loved and extra special by sharing an 'I want to know you' post with some questions to answer! I absolutely love the idea of this and want the positivity and love to keep spreading so I am going to answer Paula's questions and set them to you, my readers, today! WHAT IS THE THING YOU'RE MOST PASSIONATE ABOUT IN YOUR LIFE? My son and my marriage! They both take a lot of work but they are both so rewarding! FIVE YEARS FROM NOW, WHERE DO YOU WANT TO BE? Just happy! I don't care much for being better than anyone or impressing anyone, I just want to be happy and positive, enjoying life with my loved ones, wherever I may be! WHAT'S YOUR FAVOURITE PLACE IN THE WORLD?Okay, so I've only been once, but, DISNEYLAND! I felt so free there! It was a dream come true to be there and I'd love to go back real soon! There is this aura there, where everyone is happy and excited and you feel like a child again! No one judges you no matter how over-excited you are or how sparkly your Minnie Mouse ears are! Haha! DESCRIBE THE PERFECT DAY FOR YOU. Waking up early, spending time talking with Dan and getting Elias ready. I love to take time doing that as he will only need my help for so long and I want to enjoy every moment of it. I'd love for us to take Elias somewhere, I think the zoo. He is such an explorer, he loves to see, touch, hear everything. I think he'd love a zoo. We'd sit on a picnic blanket and share a messy lunch before coming home and making some baked treats. We could get in our cosy PJ's and watch Cars or Toy Story (his favourite films), eat our homemade treats and fall asleep together. WHAT'S YOUR FAVOURITE MOVIE/BOOK/SERIES? This is so hard as there are so many, but I'd have to say that some of my favourites are 'The Curious Case of Benjamin Button', 'Water for Elephants' and 'The Amazing Spiderman' . Each one has a beautiful score, exciting plot and stunning cinematography! WHAT IS THE FIRST THING YOU THOUGHT WHEN YOU SAW MY BLOG? You're header is just like, 'POW! I'M HERE!' I love it! The vibrant colours make me feel invited and happy and your content reflects your fun, sweet personality! Now, Id love to read your answers and, if you're a blogger, share Paula's post with your readers to keep the love going! Thankyou for such an inspiring post Paula, I hope you don't mind me sharing it with my readers too, but it was just too lovely not to! Earlier in the week my dad and sister came to visit me, and we decided to take a drive to Wickham, in Hampshire. It's not far from Clanfield and it's a gorgeous little village full of antique shops and olde worlde houses and cottages with tiny doors and even an old mill! After visiting a few shops we decided it was time for lunch and we stopped in 'Lilly's'. I'd heard good talk about it and upon entering I was not disappointed. It's a small little nook where the floorboards creak and every shelf is lined with adorable vintage memorabilia like 'OXO' stockcube tins and shabby chic style tin signs. There is a toasty fire place in one corner and a booth lined with throw cushions in the other. We were seated and Elias was made a royal fuss of, and soon after we were handed some beautiful pink menus. It was so hard to decide what to eat, everything looked so good, but we ordered our drinks and spent a little time reading through the menu. Our drinks were served speedily. Lauren enjoyed a coke and I ordered Rose lemonade, both were served in glass bottles with a glass of ice on the side. My dad opted for an Americano which was served black with milk and sugar on the side, in matching china pieces. Eventually we all decided that the buttermilk fried chicken burger in a broiche bun and skinny fries looked the best and we ordered one each. Our food was also served quickly and everything was delicious. I have never had buttermilk fried anything before, but it was beautiful, much lighter and more flavorful than regular batter - very enjoyable. Our food was served on floral china and a side salad was included too. We thought about ordering one of the rather amazing looking slices of cake but decided that we were just too full! There was a wonderful range of cakes on offer; everything from chocolate, carrot, victoria sponge and even waffles and bownies! Lilly's also offer an afternoon tea for £10.50 each which I think is quite reasonable for a small village tea room. We saw one being served to a customer and it looked so dainty; bought out on a tiered rack and presented perfectly! Something I was really impressed with during our visit was how welcoming the staff were with Elias. We've been to a few places before were staff seem to feel very inconvenienced by the presence of a baby, but the staff at Lilly's seemed to love him; talking to him, touching his hair and generally making a fuss. It was lovely, and he certainly enjoyed it! We really enjoyed our visit to Lilly's and I'll certainly be going back now that I know its only a stones throw from my house! This post is no way intended to brag, or show off. I always love to read these kinds of posts, as you often discover new brands and items you didn't know existed, so I wanted to share with you what I was treated to this year for my birthday! I always feel so spoilt on my birthday; my family and friends are so generous and I am so grateful to have been given another wonderful year with them all! My landlord and landlady are the best you could ask for! They are lovely and Dan and I often go for dinner at the village pub with them. For my Birthday they were so sweet and treated me to some gorgeous white roses and this adorable box of chocolates. Unfortunately, I have to wait until Easter to enjoy them, as I have given up chocolate for lent - but I am sooooo looking forward to it! My sister and her Fiance know me so well and their gifts were so cool! They gave me this uh-mazing Woody mug - it features various sketches and concept art ideas which were created before the Woody we all know and love came to life. I have never seen anything like this! I love it so much and Dan is insanely jealous! They also gifted me this wonderful adult colouring book and a tub of about 10,000 felt pens (actually, its a tub of 100 felt pens!)! These are so popular right now and I really enjoy them, I find that they really help to relax you and take your mind off of things. I have particularly liked this one as it also includes puzzles and half filled designs so you can really get creative! My Mum treated me to this indulgent set of Champneys nail polishes. There is a colour for every occasion and a top coat included. The bottles are quite large, too, so I imagine these are going to last quite some time. My Nanny bought me this awesome vintage style Kellogs bodycare set by MadBeauty. I absolutely love things like this! The packaging is so kitsch and the cherry scent is addictive! I am so excited to go and see Navi at The Brook (our local music venue) in April! My dad bought me 2 tickets and I just cant wait! For those who don't know, Navi is the world's Number 1 Michael Jackson impersonator, he even looks so much like Michael that he was actually used as a decoy for the real Michael, and he even performed for him a couple of times, too! I have seen him just a few times before but he takes the role so seriously and his technique is flawless, so this is going to be an unforgettable show. The Brook is a very intimate venue so I'm sure we will get an amazing view! My beautiful blogger friend Be from Love from Be so kindly treated me to a new blog design, which you can see next month! Be puts so much effort into her work and she always makes my blog look just how I dream, no matter how demanding I am! I cant wait for you all to see the new one! My dear friend Katherine spoiled me with a bag full of amazing treats. She chose this Rimmel Moisture Renew lipstick for me in the shade 'Dreamy' - she said she thought of me when she saw it as I always use that word! Hehe! She also bought me this gorgeous Contour kit by City Color. I am so excited to use this, and I have never come across this brand either, so it was nice to make a new discovery! These Amazing Shine lashes in '747-M' are just beautiful. They are made from 100% real human hair so they are super soft and natural looking and I think that they will give a good amount of wears due to the high quality. I cant wait to wear them! Katherine also packed me this darling bag of holiday essentials including things like moistened eye cucumbers, Malibu aftersun lotion, Malibu SPF 30 and much more. I love this idea! Each item is so handy and the bag was literally jam packed! I was also spoiled with money and flowers and Dan bought me something extra special which I will introduce in a post coming soon! I have been so blessed this last year and I am so excited to spend another exciting year with my family and friends! What makes your Birthday special? I have never been all that good at giving things up and I've also never taken part in Lent before, but over the last couple of years I have been bought closer to God - through a bad experience and through his connection with one of my dear friends - and although Lent isn't actually specified in the Bible, I do feel it is important to follow His teachings. Whether you observe lent for religious reasons or not, it is a fantastic way to accomplish something - to prove to yourself that you can keep to something and that you do have will power to follow through with it. I know it will inspire me and motivate me, aswell as helping me to appreciate the things I have and how lucky I am to enjoy them everyday. Lent begins on Ash Wednesday - which falls on the 10 February this year - and ends on Easter day, and this year I have decided to give up Chocolate and bread for these 46 days. Chocolates and bread are 2 things which I indulge in entirely too much (we still have way too much hanging around from Christmas!) and I know this will be a hard test for me but I am determined to do it! It is important to take a step back and realise how lucky we are once in a while. We take so much for granted in our modern lives and I think its going to be very eye-opening for me to do this. I am looking forward to being tested and hopefully it will make me think twice about what I have in the future before I consider it an everyday convenience. What have you decided to give up for Lent this year? I've never really been a big fan of Valentines Day. It's nice to show people you love them, but really you should do that all throughout the year! I know lots of people love it but, personally, I cant think of anything worse than being cramped in an overbooked restaurant with mass produced food on Valentines day. It's so impersonal and rushed. I much prefer sentimental and thoughtful things - something homemade or something you can keep and treasure; and I'm not talking spending big money either! Valentine's Day is bound to be different now that Dan&I have Elias - but, in fact, I think it will be better, we can create traditions and celebrate our love as a family. Today I'm going to explore some simple and thoughtful Valentines gifts that everyone can make and enjoy! We have a cast handprint of Elias' at home and I bought Dan a couple of memory bits for his first Fathers day, but I wanted something he could take to put on his desk at work and I thought this family handprint canvas was just perfect! I bought the canvas for 99p from Home Bargains and you can pick up colouring pencils anywhere really. I don't claim to be an artist and I know my creations won't be hanging in the Louvre any time soon, but this was a lovely thing to make. I will admit, I tried to do a baby handprint in paint but it got very messy, and smeary, and ended up in a deep scrub down in the bath, so we tried the family handprints and it was much easier. I drew around Elias' hand first (giving him a toy to hold in his other hand to occupy him from prying the pencil out of my hand) and then placed my hand over it and drew around it. You could fill this in with paint too, but I only had pencils available and they worked just fine. I decided to outline the handprints with hugs and kisses as a finishing touch. This cost next to nothing to make but it is precious and priceless to have these sorts of memories with you. These are so simple and inexpensive to make but they are very thoughtful and personal, as you can write things which are unique to your loved one. You could fill the jar with 12 pieces of paper - each with a date night or activity written on, so that your partner can pick out one each month. This is a sweet idea as it means you know will have a nice activity planned each month. These could be simple things like dinner or the cinema, or more extravagant things like mini breaks; depending on your budget. You could also fill the jar with 'good vibes' - notes telling your partner what you love about them and how they make you happy, so that when they are feeling down, they will have something to pick them up again. 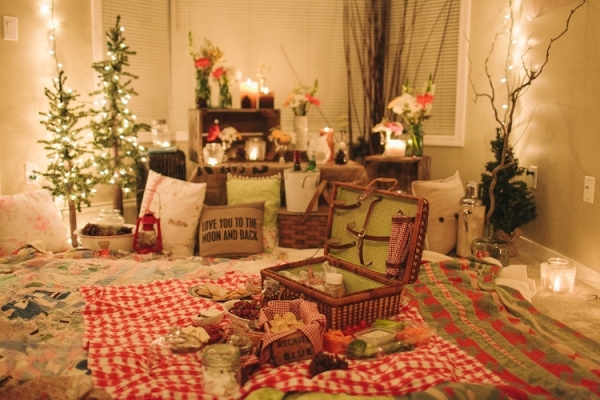 As a variation on a Valentines dinner, how about sharing a picnic? The weather isn't all that good this time of year, so you could throw some duvets and cushions on the living room floor, string up some fairy lights and put on your favourite album or movie and celebrate inside. Gather together on the cosy blankets and share some finger foods; sweet potatoe fries, breads and cheeses, cupcakes, and enjoy a sparkling drink or two. You could make it more fun by serving the food from a traditional picnic basket. Choose to include the whole family in this or wait until the children are in bed and dine as a couple. Woohoo! Its pancake day! This special little day is often forgotten about or pushed aside, but it is such fun - you can get creative in the kitchen and share a delicious hands-on treat with your loved ones! Pancakes are so versatile, you can enjoy them sweet or savoury, stacked or short. Personally, I'll have 'em any way that they come, but I can never eat many, so it's important to make each one count! - Place the dry ingredients into a bowl and stir together. - Then make a well in the dry mixture and pour on the wet ingredients. Combine well. - Transfer the batter into a jug - it will be easier to pour onto the pan this way! - Heat a smooth pan and add some butter, oil, or spray oil. - Pour a round of batter onto the pan and cook for around 1 minute per side. Delicious Nutella sandwiched between 3 pancakes, more Nutella drizzled liberally on top and sprinkled with crumbled wafer. Then, finished with a decadent Ferrero Rocher! This is probably the one I'll be opting for as my birthday was yesterday, and, well, it would be rude not to celebrate properly! Soft, fluffy pancakes layered with vanilla icing and finished with colourful sprinkles - you could even add a candle if you're feeling extra festive! oozy caramel, sweet marshmallow, crispy wafer and decadent chocolate - this is an ultimate treat! Warm pancakes caramel sauce, topped with vanilla marshmallow fluff, crumbled wafer and grated dark chocolate. Finished with a chunk of dark chocolate! I hope you enjoyed my pancake-spiration! Whatever you indulge in today, enjoy it and be guilt-free! Eyeshadow palettes are something I have a healthy stash of, but I always seem to stick to the same few. Its no secret that I prefer earthy toned shadows - browns, golds and deep reds and that reflects in my favourite palettes which I'm going to talk about today. I don't own many high end palettes, as I feel that drugstore brands have come a long way recently and offer just as high quality at a much more reasonable price, but that's not to say I don't enjoy indulging in something a little more luxurious occasionally. This is probably the most expensive palette I own, but I didn't mind investing in it as I knew that I would get good use out of it. You can see that I've already hit pan in shades 'Foxy' and 'Tease'- I tend to use these a lot as they are great all rounders, 'Foxy is a great base shadow and 'Tease' is perfect for applying to the socket for some definition. I also like to use shades 'Snakebite' and 'Blackout' when I'm (trying to) create a smoky eye look. I have really enjoyed using this palette and the brush which comes with it is actually useful too, not one of those annoying little sponge applicators that no one even uses, the only thing that makes me think I wont repurchase it is the price, as I've now discovered the Makeup Revolution Iconic palettes. Ah, good old Makeup Academy! I was umm-ing and ahh-ing about getting this palette for ages and I finally picked it up when it was a part of an offer and it is just amazing. The colour pay off is brilliant and the mix of shimmer and matte shades makes it very versatile. I find that all of the shades have pink undertones, so its a great palette for creating simple everyday looks with a little something different - and the shimmer shades make for great highlighters too. The shimmer plum tone is a nice alternative to black when creating a smoky eye and I find the metallic rose gold is just perfect for placing on the inner corners of the eye. This also comes with a duo ended pencil which has a kohl eyeliner on one end and a highlight on the other end. All in all, a fantastic budget palette which has rightfully earned its place in my top 5. I picked this up a couple of years back in my first BH Cosmetics order, along with 2 other palettes and a foundation. Unfortunately, I was stung with an £18 customs charge, but it was worth every penny. I loved everything I ordered from BH but this was the stand out item to me as it is just so unique but still usable. I had never used a baked eyeshadow before this, but i can now see the appeal as the pigmentation of the shadows is incredible. I tend to use shade 'Sun' most as it is just perfect for applying all over the lid to give the eyes some life on those days when you don't have time to create a whole look - 'Mars' is also great for this - and it's also a beautiful inner corner highlight. I also adore using shade 'Aphrodite' during the autumn months. It's a gorgeous alternative to browns and I feel the berry tone really compliments my green eyes. When finished with some black winged liner and a swipe of mascara it is just incredible. Although I dont get the chance to use the more colourful shades in the palette all that often, I still feel this deserves its place in my top 5 as the shades are just unlike anything else I own, they combine colour and a pearl finish skilfully, without being 90's or tacky, and they apply and blend like a dream. Another bargain palette that I think every girl should have in her collection. The Makeup Revolution Iconic palattes have been dubbed dupes for the Urban Decay Naked palettes and, as previously mentioned, I have found this to be very true. The Iconic 3 palette offers 12 shadows in a mix of matte, shimmer and metallic finishes and I find it to be so versatile. I have only recently picked this up again after a few months of not using it and, as you can see, it looks virtually unused - this is because the powders are so pigmented that you only need the smallest amount on your brush. You're probably fed up of hearing me rave about this, but it is just so amazing - would you look at those colours?! This is my newest palette - I received it in my swapbox with Sarah from DiaryOfABeautyPadawan a few weeks back - but it is quickly becoming my favourite. I find the shades to be so versatile and wearable, they blend to perfection and apply so smoothly. I wear this most days as you can really create some amazing, subtle yet beautiful daytime looks with it - and you can use the darker browns for a smokier finish. Just like with the 'Galaxy Chic' palette, I enjoy using the red shadow to really make my eyes pop and give some depth. I think the design of the palette is so sleek - the curved edges make it different than any of my other palettes, and you get 2 applicators with it too. If there is one thing the internet is good for, it's making friends, and I am so happy to say that since starting my blog I have made friends from all around the world! It's lovely to speak to people who you would never normally have the chance to cross paths with. I find that my online friends are some of the most honest and refreshing people I have met, plus the fact that they are also bloggers means that they can really relate to blog-related meltdowns! You may remember the post I did a while back all about my beauty swap box with xoxomeaghan - it was superfun and gave me a drive to do more swapboxes with some of my other friends from around the globe! Its fun to try out products from other corners of the world and to pack up and send off some good old British favourites too. I was absolutely thrilled to find this treasure in my swapbox. I have heard so many good things about Chi Chi and its so exciting to get the chance to try it for myself. Sarah said she thought the shades were very me, and boy was she right! I will be doing a more in-depth look at this palette in a post soon (with swatches), but I will say for now that it is just gorgeous. The powders are soft and highly pigmented and they blend so well on the lid meaning you can create softer or more dramatic looks. There are 12 shades included in the palette in a mix of matte, shimmer and metallic finishes, all with earthy tones, meaning you can create an endless amount of looks for day and night time! Overall, the perfect palette for me! I just love the fact that Sarah said she chose these for me due to the shade names! What a girl! The Australis Velour Lips Matte Lip Creams are vegan and - like all of their products- are cruelty free, which is something I am really looking for in all my future beauty purchases, so its good to find another brand I can opt for. The formula of these lip creams is just amazing - it's like buttercream gliding across your lips and it smells so sweet, too. Both the colours are highly pigmented and the non-drying formula lasts for hours on my lips without flaking or peeling, which is pretty impressive for a matte finish product. I am surprisingly in love with 'Mel-Burn', I never thought I would wear a black lip product but this does look amazing with a strong contour and smoky eye! Mascara is something I can never get enough of so I was happy to welcome this one into my collection. Again, its not tested on animals, so I can wear this guilt free - and the results are impressive! The wide tooth comb brush helps to coat each individual lash making them super long and dark and leaving my eyes with a wide open look! I love the curl this mascara gives my lashes! I like the contrast of the vibrant pink and sleek black on the packaging too. I think this is going to be one of my most used lip products this spring, as the pretty pastel pink shade is just perfect for those sunny days. The Face of Australia Lip Quench lipsticks are full to burst with enriching and moisturising ingredients like jojoba oil and shea butter. They have a delicious vanilla scent and feel so smooth on the lips. I love the design of the packaging as it has a little window on the top allowing you to peek and and check what colour you are picking up! How handy! Something that will never go out of fashion is your trusty black eye pencil, its good for an infinite amount of looks and I like the fact that you can smudge it for a grungier, smokier edge to your look. I really like the Model Co pencil that Sarah chose for me as the colour is intense and long lasting and it even has a handy sharpener in the lid! 10/10! This was the item I was most excited to try! Sarah told me that she had included a MooGoo product which me and Elias would be able to enjoy and I was eager to see what it was! The MooGoo Full Cream Moisturiser is so rich and luxurious. It is made from all natural ingredients and is designed to help with irritated or broken skin; and let me tell you it does just that! Ever since I was pregnant I have had a strange eczema-like rash all over the back of my right hand and down the inside of my wrist - it itches and bleeds if I scratch too hard and nothing was helping - until I tried the MooGoo cream. It started to help from the first application and my rash has actually cleared up completely now! Fantastic! Thank you MooGoo! The cream has a light scent of honey - this is one of the natural ingredients included - and it is just so nourishing. Elias loves to have this massaged on him after his bathtime every evening (I can see that we will need another bottle soon!). As you probably know, something which I am a real sucker for is an adorable packaging, and MooGoo have certainly taken care of that. each tube of Full Cream moisturiser comes in the cutest milk carton shaped box with a beautiful blue and white colour scheme and a darling little cow illustration. I am in love! I was absolutely thrilled with everything Sarah sent me in my box - she was so thoughtful and definitely included things she thought I would enjoy most! I am so lucky to have been able to try these wonderful products which I normally wouldn't be able to get my hands on and, let me say, Australia, I am truly jealous of your beauty offerings! Thankyou so mucy Sarah, and I hope you enjoy your box as much as I did mine!